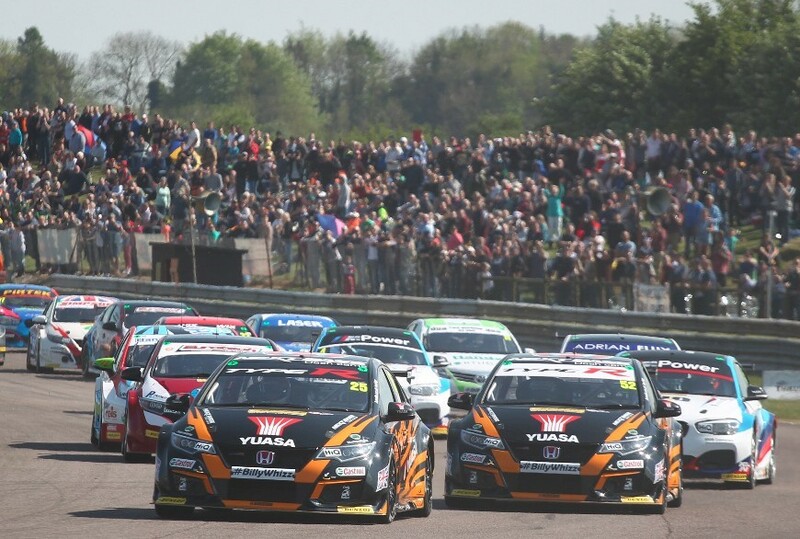 Halfords Yuasa Racing enjoyed a successful weekend on ‘home’ soil as the Dunlop MSA British Touring Car Championship sped into ultra-fast Thruxton, with Gordon Shedden outscoring all of his rivals on the same weekend that Matt Neal reached a major milestone. In front of a host of Honda employees – with the brand’s UK manufacturing headquarters just up the road in Swindon – Neal and Shedden locked out the top two spots on the starting grid in qualifying, as the former snared his 16th BTCC pole position and the latter belied maximum ballast to join him at the sharp end of the field. Neal converted that into his 60th career triumph in race one – in so doing drawing level with tin-top legend Andy Rouse in equal-second place on the all-time BTCC winners’ list. Shedden followed his Halfords Yuasa Racing team-mate home for the runner-up laurels, as Honda cars secured all three spots on the podium. A similar result looked to be on the cards in race two as Neal led away again, until a power steering issue sent him darting for the pits at the end of lap two. Upon rejoining the fray, the three-time BTCC Champion posted what was comfortably the fastest lap to underline what might have been. An early ‘moment’ on cold tyres saw Shedden shuffled back to fourth, but the Scot immediately fought back and was sizing up Rob Collard for the lead when the red flags flew once more – this time for good – on lap seven. In the day’s finale, from fifth on the reversed grid, Shedden had to dig deep to unseat Rob Austin’s lighter Toyota from fourth position and complete his weekend with another very strong finish, while Neal took no prisoners as he scythed his way through from 29th to tenth at the chequered flag – although he was subsequently demoted to 11th after being adjudged to have gained an unfair advantage in overtaking a rival. Shedden’s excellent haul saw him vault from fourth up to second in the Drivers’ standings – just 17 points adrift of the lead – with Neal similarly in contention in seventh. Honda has gained ground in the Manufacturers’ classification, as Halfords Yuasa Racing maintains second spot in the Teams’ Table.